Auburn alum Katie Barrier of The Pine Hill Haints wonders if the white team's circle of blockers of will be unbroken. A-Day is a carefully orchestrated dichromatic waltz played smooth and slow, drawn out over several unsurprising hours. A-Day is sheet music. It’s following the rules because—because just because; that’s how’s it’s always been done. It’s tradition and manufactured advertised family. It’s new basketball coach introductions and Gene Chizik selling Bryan hot dogs. The Old 280 Boogie is jazz, at least in concept. It’s free-form and flowing. Children twirl and gyrate to a rockabilly crooner with Elvis hair. Petite ladies wearing tie-dye shirts slither hula hoops around and around and around. Overalls and neon purple American Apparel shirts are paired. Pabst and moonshine. Cigars and old-man pipes. Small towns and hipsters. It’s hard for me to imagine spending a more diametrical day in Alabama: from Southeastern conference football to a celebration of Southern eccentrics. I can’t say I love one more than the other. Or that one is inherently better or “cooler,” whatever you want that to mean. I love them both—stiff and slow-to-change football and look-at-us-aren’t-we-weird? festivals—but I don’t feel totally comfortable at either. Maybe if the two were combined. If somehow Auburn could run into Jordan-Hare to the Fleet Foxes’ “Mykonos,” Cam Newton sporting an ironic mustache and Mario wearing a pink “Legalize Gay” shirt while playing the harmonica, I could be satisfied. Never going to happen, of course – Mario hates pink. The two will forever remain separate, each side’s head swelling with smug superiority. And, people such as myself and Jeremy, who also attended both, get to write mini-essays both admonishing and praising the differences. That way I can pander to each crowd. A splish of athletics mixed with a splash of the esoteric. 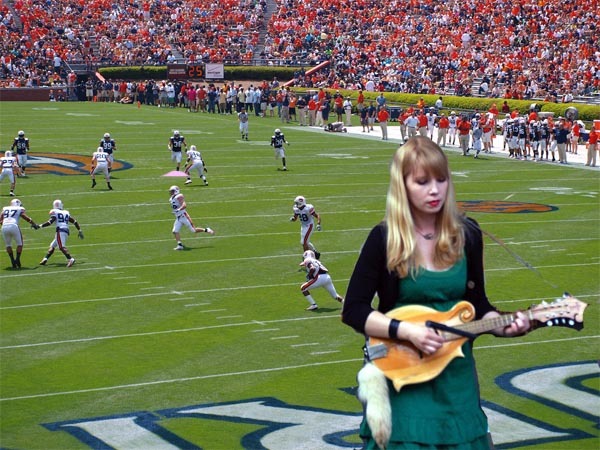 A common criticism of Auburn is that it lacks diversity, in thought, dress and race. And that’s probably true, to an extent. To walk around Auburn is to see the same basic caricature again and again. And that’s bad. There should be something to shake these people (excuse the pompous term) from their safe and conformed lives. The sheep need to be attacked by wolves now and again. But, at the same time, too much ain’t-we-neat, back-slapping from the “different” crowd does nothing. It’s a different verse of the same song. There is such a thing as conformity disguised as non-conformity. It’s a cliché at this point to mention, but football doesn’t “matter.” Neither does the dancing and the smoking and the drinking. Education and too much of the book learning lets you know that. But they’re fun. And we need them. So War Eagle and skiddilydoo. Ben is a student at Auburn University. Most of his time is spent doing as little as possible, eating and controlling manageable vices. He will one day graduate with a degree in journalism and maybe find a job. Fingers crossed. Write to him at [email protected]. Auburn and everywhere else does need them. Thanks for the cool article. I would say that it’s not that your love of AU football is less now, it’s just that other things (rightfully so) start taking higher priority. This maturing will keep you from standing in line at Wal Mart for 4 hours for a picture of a glass trophy. Great article. Been there, done that in my time on the Plains. I hung with the Polo crowd at Bodega and Bourbon Street many nights, and then many lazy afternoons at Webster’s or Earth Day festivals with the hippies, and also plenty of beer drinking with the Wire Road vet school straight country folks at the old Strutting Duck or Champs. So I totally get what you’re talking about. Anybody that tries to only paint themselves within one group in college (particularly in Auburn) is missing out on a hell of a lot fun. For the most part, the blending of the different folks seemed to go fairly smoothly 90% of the time. But then you had the folks that just liked to cause trouble and thought they were superior in some way to the “frat boys” or the “hippies” or the roper and wrangler boys. They just didn’t get it. They probably still don’t. Good people are good people regardless of what they wear or drive. I am superior to every hippy.